For over 25 years since the release of Hidden Agenda (1990), Ken Loach has been the most consistently successful British filmmaker – not in gross box office, but simply in terms of producing films regularly and putting working-class characters (English, Irish, Scottish, Spanish, Latin-American) on screen in ways that do them justice. Before that he had a prolific career in UK TV drama and film and a great success in cinemas with Kes (1969) before he was sidelined in the Thatcher 80s when ‘greed was good’ and the working-class were hammered before being marginalised. Ken will be 80 in a few days and this new documentary was released midway between his birthday and the award of a second Palme d’Or at Cannes to his company Sixteen Films for I, Daniel Blake. Ken Loach certainly deserves a cinema documentary made about him. Unfortunately there are some problems with this one. Director Louise Osmond is a celebrated documentarist whose last film Dark Horse (2015) won prizes at Sundance and at the British Independent Film Awards and she had full access to Loach’s preparations for shooting I, Daniel Blake, as well as to Ken and his collaborators. I’m puzzled by the lack of real analysis of the work and by the poor technical qualities of her film. To be fair, Ken Loach has had an eventful life so far and his films and television material represent a formidable body of work. To do justice to the man and his work would need a documentary series rather than a single 93 minute film. I’ve seen all Ken’s feature films (apart from the new one) and most of the important TV work. It isn’t surprising then that I enjoyed being reminded of the work and that I was grateful for the archive material insights into his early life alongside the contributions of his family. The film also includes useful contributions from Tony Garnett and Gabriel Byrne (who give the best insights into Loach as a committed director) and a host of other talking heads with stories and observations. Osmond’s strategy is to use the making of I, Daniel Blake as a running example of Loach at work. She then breaks into this ‘making of’ narrative to visits distinct periods in Loach’s life and career, not necessarily in chronological order. There are arguably four sections to the film to add to the ‘making of’ doc. We get archive photos and memories to learn about both Loach the boy from Nuneaton and Loach the paterfamilias in later life. Tony Garnett takes us through the early work at the BBC and explains that Ken was not really ‘politicised’ until he met the writer Jim Allen in the late 1960s. Garnett’s analysis ends with Kes in 1969. The third section deals with the frustrations of the 1970s and 1980s and in particular on the cancellations of TV commissions and the last minute cancellation of Jim Allen’s Royal Court play Perdition in 1987 – a furore over the exposure of Zionism during the Second World War in Hungary that seems very contemporary today. Loach was reduced to making commercials to avoid financial disaster – something which still makes him feel ashamed. The fourth section plots the ‘renewal’ following a Cannes prize for Hidden Agenda. Throughout the film Ken responds carefully, guardedly perhaps with lots of self-deprecation, but also occasionally with the steely determination mentioned by both Garnett and Byrne. The technical problem with the film is now a common-place – and already identified as a problem with Loach’s own Spirit of ’45. All of Loach’s early TV work was shot 4:3 on video or 1.37:1 on 16mm film. Even a feature like Kes was shot for 1.66:1 projection. Yet in Versus all this early material is either cropped or squeezed to fit a 1.85:1 ratio (in fact it might even be 2.35:1 Not only this but the archive footage seems to have come from someone’s old VHS collection and it looks dreadful. Even the extracts from some of the later films look like poor copies. I’m worried that younger audiences will look at these downgraded images and fail to appreciate not just Ken’s direction but the great cinematography of collaborators like Chris Menges and Barry Ackroyd. Menges is interviewed in the film but not Ackroyd – who helped establish the Loach style of social realism in the 1990s (as against the more naturalistic style of Menges’ work on Kes). The film does attempt to explore Loach’s work with actors and it does mention the Czech New Wave (to underpin Menges’ comments) but there is much more to the development of Loach’s approach than that one film movement. Some explanation of neo-realism and possibly some discussion of Robbie Ryan’s current work for Loach would help to dispel the view that Ken’s importance in British Cinema is just down to the subject matter of his films. There is a brief discussion of ‘Ken at Cannes’, but it would have been good to hear from some of his many European supporters why they are so passionate in support of his films. My other moan is about what is becoming a modern documentary convention for ‘bio-docs’ – the shot of a location for no real reason except to break up the talking heads. Here we get shots of Blackpool Central Promenade because the Loach family went there for their annual one week holiday when Loach was a child – and because Thatcher made speeches there at the Tory Conference. Similarly we get aerial shots of Oxford, again from not very good footage. Versus seems to me to be a rushed project made on a low budget that struggles to do full justice to its subject. I realise that documentarists have to select carefully and they can’t include everything, but in this film the choices could be better. I assume that they were made because of constraints. I do applaud the ‘pay what you can’ screenings that helped launch the film in cinemas and it’s true that the technical limitations of the image might be less visible on smaller screens, so I hope it does find some new audiences for Ken Loach’s work who will want to explore the films in more detail. The police arrive in a Durham pit village to arbitrarily arrest striking miners under Emergency Powers legislation in 1921. A shot from DAYS of HOPE Part 2. HOME in Manchester has more events, seasons, special screenings and guests than most other cinemas in the UK. Last night a major retrospective of the work of Jim Allen (1926-1999), Manchester’s own brilliant screenwriter, began with one of his most important TV works Spongers (1978), produced by Tony Garnett (who I think attended the screening). Jim Allen was a committed socialist and he is probably best known for his work with Ken Loach and Tony Garnett. Tonight there is a double bill of two of the most hard-hitting TV plays he wrote: The Lump (1967) set in the building industry was produced by Garnett and directed by Jack Gold and The Big Flame (1969) again produced by Garnett was directed by Loach. The season, curated by Andy Willis, runs until the end of January and the remaining titles are listed on the HOME website. The season has been structured so that the TV plays tend to come first and the films later. Jim Allen wrote seven film scripts for Loach, three for the cinema and four for television. All are showing in the HOME season. Raining Stones (1993) is on Wednesday 20th January, Hidden Agenda (1990) on Saturday 23rd and Land and Freedom (1995) on Sunday 24th. Most screenings start around 17.00 or 18.00 but the Sunday screening of Land and Freedom is at 13.00 so people outside Manchester can get over for the weekend for a double bill. For me, the most exciting part of the season is the final weekend when all four films making up Days of Hope (1975) are shown over Saturday 30th (parts 1 and 2) and Sunday 31st (parts 3 and 4) starting at 12.50 on both days. Days of Hope caused a furore when first broadcast on BBC1 and abroad the films were screened in cinemas. Although shot on 16mm these films look best on a big screen and they tell the tale of a working-class farming family from North Yorkshire and how the younger members fare over the period from 1916 to 1926 when, as Allen and Loach see it, the miners are betrayed by Trade Union leaders and the right-wingers in the Labour Party. A commentary on the politics of the 1970s as well as the 1980s and 1990s, Days of Hope seems just as relevant today (and that is indeed the sub-title of the retrospective). If you agree, a weekend in Manchester beckons! Christmas Day is a problem in our household. Most cinemas are closed and the TV offer is unwatchable so it has to be a DVD. This time Ray brought over his projector and because of forthcoming rail journeys in Italy I suggested Tickets – a ‘portmanteau’ film in which three directors tell three separate stories involving passengers travelling between Innsbruck and Rome. Although all three stories are distinct there is an overlap with a group of characters appearing in more than one story. The story began as a suggestion by Abbas Kiarostami in a discussion with producer Carlo Cresto-Dina and editor/actor Babak Karimi. The original idea was for three linked documentaries. 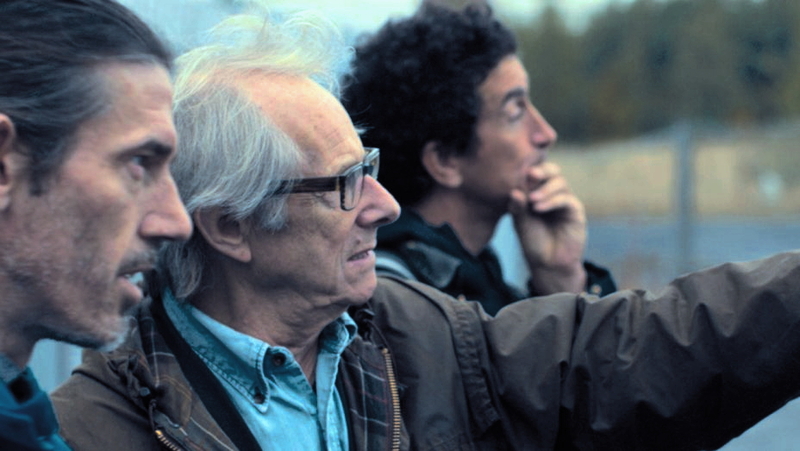 The other two directors who were invited on board were Ermanno Olmi and Ken Loach. In the ‘making of’ documentary included on the Artificial Eye DVD we see the three directors with their interpreters eventually deciding to make a trio of linked fictional stories. This discussion is interesting because it is Loach who effectively sets up the format when he says that he can’t work on Olmi’s suggestion of ‘three colours’ as a starting point because it is too abstract. Instead he suggests a story idea that involves migrants or simply travellers who are involved in stories that cross national and cultural boundaries. Loach is closest to the original ideas of neo-realism – stories taken from the world, not imposed upon it. Also interesting is that Loach is accompanied by his three close collaborators, Rebecca O’Brien (who attends the initial conversation), screenwriter Paul Laverty and cinematographer Chris Menges. The other two directors both have collaborators as well but they didn’t seem to have the same input from the evidence in the documentary. The journey begins with Ermanno Olmi’s story in Innsbruck where an Italian scientist has been attending a meeting at a pharmaceutical company. Because of a security alert he is unable to return by plane and has to take a train. The train is booked by a PR person (played by Valeria Bruni Tedeschi). The elderly professor is anxious to return to Milan in time for his grandson’s birthday. He is very taken by the beautiful and efficient Ms Tedeschi and he fantasises about her via a memory from his childhood about a girl whose piano-playing he heard through a window. These thoughts run through his head as he taps away on his computer in a crowded train compartment. Olmi carefully contextualises the professor’s story by reference to the people around him in the carriage. It’s interesting that Olmi’s story benefits from the ‘open’ architecture of the dining car: the seat backs are relatively low (i.e. not the ‘airline’ style) and therefore the camera can frame many passengers together, allowing a kind of commentary on their actions. I assume that this is a deliberate choice of rolling stock as Olmi tends to stage scenes in depth. Olmi also shoots on a stationary carriage with back projection through the carriage windows. At the end of the episode the professor makes a humanitarian gesture to a family forced to sit on their luggage in the vestibule at the end of their carriage – and everyone in the dining car follows the action. The airline style seats in the second train help to direct the gaze more directly. Silvana De Santis is the aggressive woman, here staring at the attractive woman who has caught the eye of the young man. This same family is seen to change trains at Verona and Abbas Kiarostami’s story is set on the second train travelling to Rome. In this story we meet a bossy and aggressive middle-aged woman. She has several heavy bags and is accompanied by a young man who at first seems like her grandson. She sits down in First Class on reserved seats and is then involved in two unnecessary arguments caused by her aggression. She treats the young man badly and he goes out into the corridor and talks to a teenage girl who says she knows him and refers to a time several years ago when they both lived in the same small town of Bracciano in Lazio region, north of Rome. This is the most inconsequential story in terms of narrative development, but it offers a first glimpse of the three young Celtic FC supporters who feature in the final story. Loach’s story (from Paul Laverty’s script) sees the three young Glaswegians meeting the young boy from the migrant family. They treat him well but a little later one of the three discovers that his train ticket has gone missing. The ticket inspector (who first appeared in the Kiarostami story) says he must buy a ticket and pay a fine. The three lads don’t have any spare money and they conclude that the boy they befriended may have taken the train ticket when they showed him their tickets for the football game between Celtic and Roma. What happens next becomes the sequence which delivers the resolution of the overall narrative. I enjoyed all three stories but they are each different in approach. Olmi’s story is the most ‘theatrical’ and the most complex in narrative terms. It includes scenes set ‘outside’ the world of the train. It does however also include some forms of social commentary. Kiarostami’s story is the most tightly-focused but the most difficult to ‘read’. He offers us an example of ‘bad behaviour’ by the older woman with ‘mitigating circumstances’ – behaviour that is tolerated and treated with some humanity by the ticket inspector, possibly because that is the easiest way for him to handle it. The conversation between the young man and the teenage girl is more puzzling in terms of its meanings, although it may be there to show that the young man once caused distress to someone else without intending to. The young man is actually carrying out ‘community service’ – I’m not sure if this is because he has been convicted of a criminal offence or if this is a different kind of national ‘requirement’. It occurs to me now that all three stories are concerned with some kind ‘service’ or action of generosity. Kiarostami’s story is simply the most complex expression of what ‘service’ means. The Laverty/Loach story is much more obvious in its portrayal of the dilemma of charity/generosity. It is also the most clearly associated with social difference/inequality. The Glasgow lads are working-class Scots (played by three young actors who all got their first roles in Loach’s Sweet Sixteen (2005). They want to be generous but they don’t want to be conned. The ticket inspector is this time more officious (he has already had a run in with them because of their boisterous behaviour) and his humanity has been abandoned – forcing the lads into desperate action. Deceptively slight, the three stories do make a coherent whole and they do tell us something about human relationships and our capacity for behaving well. I saw the film when it was first released but I got much more from it the second time and I feel encouraged to watch it again. The making of documentary suggests that the overall narrative sees the train as the locus for meetings between different groups of people and the rail tickets are symbolic of the ‘exchange’ of services. In the first story the professor receives his ticket graciously from the PR woman who has booked it for him and who gives him two dining car tickets to make sure he isn’t interrupted. He ‘repays’ the generosity by his gesture to the migrant family. In the second story the woman abuses the contract represented by the ticket and she eventually pays a price. In the third story working-class solidarity wins out over officialdom. Fatherland was the only cinema feature by Ken Loach that I hadn’t seen so I was pleased to find the Region 2 DVD from Park Circus. This is an unusual film for several reasons and although it presents some problems I did enjoy watching it. It raises a range of interesting questions. Loach found it extremely difficult to work in the UK in the 1980s, partly because of the lack of television commissions in a climate of Thatcherism and partly because the UK film industry hit bottom in terms of audiences and films produced. Fatherland was the last cinematic outing for Loach with Kestrel Films, the company he founded with Tony Garnett, and funding was forthcoming from the only source readily available in the 1980s – Channel 4. Even so the film needed to be a co-production with French and German partners. Although the European market had been a consideration for earlier Kestrel/Loach films (e.g. Black Jack), Fatherland was Loach’s first venture abroad in terms of production. Later he would make films in Spain, Nicaragua, the US, Ireland and Italy etc. Fatherland was a genuine international co-production and Loach shot partly in Germany with a German crew and UK department heads. This is one of the relatively few Loach films not written by one of his three regular writers Jim Allen, Barry Hines and Paul Laverty. However, Trevor Griffiths had been on the Loach/Garnett radar for some time and by the mid-1980s he had become well-known as a playwright and a film and television writer – often of stories with a political setting. Fatherland refers quite literally to ‘my father’s country’ and also to the wider usage of ‘my homeland’, in this case Germany – in the guise of East Germany (the GDR). The central character is Klaus, a ‘protest singer’ (played by the real singer Gerulf Pannach, who had a similar biography and who provides some of the music – which I liked very much). He finds himself persona non grata in East Germany because of his songs and is effectively deported (given a ‘one-way visa’) to the West. There he finds himself caught up in a propaganda war and treated like a commodity by an American record company which offers him a lucrative contract in return for exploitation of an image as a ‘defector’. But his family circumstances are of more immediate concern. Before his departure his mother gives him the key to a safe deposit in West Berlin where some of his father’s papers have been stored. Klaus hasn’t seen his father, also a dissident musician, since 1953 when he left the GDR. Where is he and what has he been doing all this time? Klaus sets off to find him with a young Dutch-French woman who also seems to be searching for him and already has a lead. The first thing that I want to say is that the presentation of the film on the Park Circus DVD is very good and that Chris Menges’ cinematography is a thing of wonder. 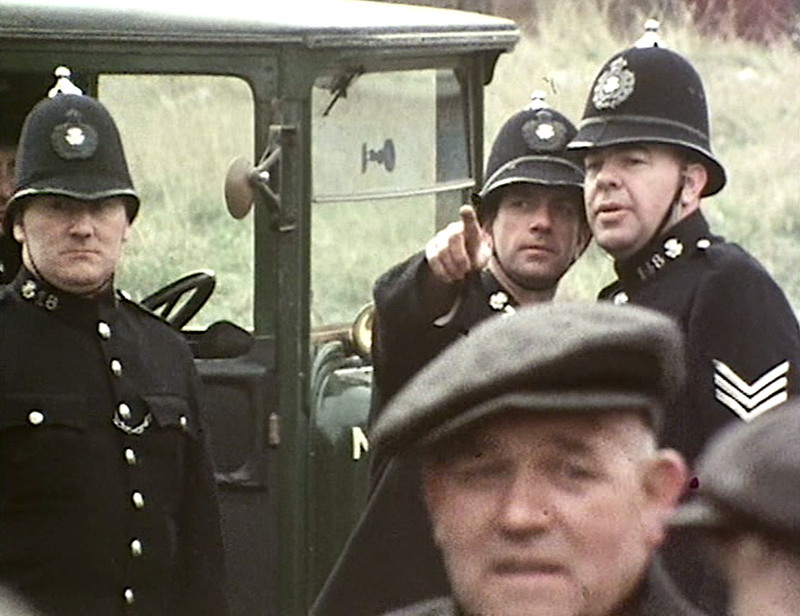 Menges worked with Loach intermittently over a long period between Kes (1969) and Route Irish (2010) and by my count is second only to Barry Ackroyd in terms of Loach collaborations as a cinematographer. He brings a certain kind of ‘romantic naturalism’ to Loach’s films, unlike the documentary style of Ackroyd (which I think is still the defining Loach ‘look’ for many audiences). Menges works here with the other long term Loach collaborators, Martin Johnson as ‘Art Director’ and Jonathan Morris as editor, offering us contrasting views of East and West Berlin and finally of a trip through East Anglia to Cambridge. Menges is also required to present some black and white ‘dream/nightmare material’ – representing Klaus’s disturbed state. I mention these aesthetic ‘tasks’ for cinematographer and art director because they have been picked out by John Hill, one of the film scholars most associated with studies of Loach’s films, as indicators of the problems in the film. Hill (1997) argues that the script pushed Loach towards the European art film and away from his familiar sense of using characters and locations he understood so well. Loach doesn’t speak German and much of the dialogue in the first section of the narrative is in that language. Similarly he had some difficulties working with the German crew. The ‘modernist’ devices such as the dreams, the use of intertitles for the three separate locations (political slogans in German) and the jumps in narrative time created through editing were part of Loach’s repertoire in the 1960s but again here they disrupt the transparency of realism/naturalism. Loach himself in Graham Fuller’s book of interviews (1998) argues that he ‘failed’ on the film and was unable to deliver what the script required. He refers to his own ‘observational style’ as inappropriate for the material. I’m not going to disagree with John Hill and obviously I can’t argue with how Loach himself felt about the film, but I do want to suggest another approach. Hill uses the Bordwell and Thompson definition of art cinema but doesn’t refer to any specific films. I was struck by similarities with various German films both closer to the period of Fatherland‘s production and more recent. Such comparisons also suggest the generic concerns of German (and other European and American) films. For instance, there is a mix here of two familiar narrative themes. Klaus faces similar questions as a dissident in the East who moves to the West as do some of the characters in Margarethe von Trotta’s Das Versprechen (The Promise, 1995) and Christian Petzold’s Barbara (2012). Once in the West the search for the father takes on a familiar thriller mode and given the real sense of being ‘watched’ ties together Klaus’s fear of the Stasi in East Germany and the conspiracy thrillers of US and and UK filmmaking in the 1970s and 1980s. Hill argues that Loach is not able to develop his usual approach to characters and locations and that he ‘resorts’ to shooting Cambridge as a tourist destination. I think that this misses the point. Cambridge is the appropriate location for these genres – it is home to exiles, fenland villages are the preferred ‘hiding places’ for certain kinds of exile and East Anglia in the 1980s ‘fits’ the conspiracy thriller because of the American air bases still in use and relatively close in Mildenhall and Lakenheath. In addition, I don’t think Loach treats Cambridge as a tourist destination. Apart from one shot down a main street, the main location is the open-air market where Klaus and the journalist/investigator Emma go to buy second-hand clothes. The main problem with the narrative is that the two stories don’t really mesh and that Loach’s discomfort with Griffiths’s script is evident in the seeming lack of confidence with which Loach handles the narrative and the actors. Or at least that is what I get from Loach’s own comments. He tells Fuller that his own observational style didn’t fit with Griffiths’ more literary script – he just couldn’t do it justice. The action needed to be more plot-driven whereas he was more used to allowing actors to find the ‘natural’ way to act out the scene. Loach implies that it wasn’t that he and Griffiths had a disagreement, rather that their approaches were simply different. Loach also admits that at this point he simply wasn’t “competent at filmmaking” (Fuller 1998: 60) – the difficulties he faced in getting work transmitted/screened were presumably having an effect on his confidence. Whether or not we accept Loach’s comments at face value, the script and the completed film still offer some interesting ideas about politics in the mid-1980s. Klaus is a hero for the anti-Stalinist socialist. His dissent in East Germany is voiced against the regime, not against socialism and it does not imply any compromise with ‘social democracy’ in the West. The press conference at which Klaus is introduced to Western journalists is shown twice – once in the title credit sequence and then again in the chronology of Klaus’ journey to the UK. Klaus refuses to say he is happy in the West and then insults the West German Minister for Culture when the politician trots out the “I disagree with what you say, but I defend your right to say it . . .” line. Klaus says that he sees West Germany as a continuation of the ‘fascistic state’ under the Nazis. I enjoyed this sequence very much – it’s so refreshing to see someone not prepared to kow-tow to convention and to maintain a thought-out political position. The exchange reminded me of the time around the late 1970s/early 1980s that teachers in the UK were asked to support their fellow trade unionists in West Germany who were faced with the Berufsverbot – a ‘professional ban’ on political activists from appointment to various public sector jobs, including teaching. These responses are matched later when Klaus under pressure to sign a recording contract, does so only after crossing out the majority of its clauses. It’s perhaps worth pointing out here that the three slogans which introduce each location are: ‘Actually existing socialism’ (Ost Berlin), ‘Grosse Freheitstrasse’ (Great Freedom Street – West Berlin) and ‘Stalinism is not socialism, capitalism is not freedom’ (on the train to the ferry in Holland). Klaus and Emma (Fabienne Babe) in disguise in a ‘stakeout’ of a post office in Cambridge. The link between Klaus’ experiences of the FDR (West Germany) and his ‘quest’ in travelling to Cambridge is his father’s letters and the other materials in the safe deposit box. These refer back to his father’s journey to to fight in Spain in 1936 as a German communist – but what then put him in back in Germany under Hitler and then exiled him to the US before his final exile in the UK? At this point the thriller/conspiracy narrative takes over. Ironically of course, Loach would return to related questions about socialists fighting in Spain in Land and Freedom, 1995). When I think about it, the two plot points in the car journey to Cambridge do seem rather heavy-handed in showing the UK to be just as repressive as West Germany (which was probably ‘true’ in 1986). What is odd, perhaps, is that a socialist like Klaus would come to the UK with a young woman he didn’t really know (i.e. in regards to her politics) without seeking to find some British socialist contacts who might help him in his quest. This for me is the ‘disjuncture’ with Loach’s British films rather than the aesthetic differences noted by John Hill. Dialogue with Brits at this point might help the political discourse to cohere. The introduction of Emma also tends to hint at a possible emotional involvement that I’m not sure the script knows how to handle (or perhaps it was intended to but got cut?). Klaus is concerned about his son but his divorced wife has re-married. Personal emotions are part of the political but we don’t really see this with Klaus. Fatherland is certainly flawed, but its problems are interesting and now I feel that I need to re-watch Riff-Raff (1991), usually seen as the ‘comeback’ or ‘re-launch film for Loach and to consider it alongside Fatherland and Hidden Agenda to appreciate the changes. In 1965 Ken Loach began working on ‘The Wednesday Play’ for BBC Television. These feature-length films, initially shot on video in studios but gradually moving into 16mm film production, attracted audiences of over 10 million. Many of them dealt directly with contemporary social issues, often creating headlines in the press the following day. Three Clear Sundays is a drama about capital punishment – the title refers to the statutory period between sentence and execution in which an appeal for a reprieve could be made. This was a live debate in the UK at the time – the death penalty for capital murder (death by hanging) was commuted to life imprisonment later in the same year, 1965. The last executions had actually taken place in 1964. The script was written by an ex-con James O’Connor. It tells the story of Danny Lee (Tony Selby) a London street trader (‘barrow boy’) who is sentenced to 6 months in Pentonville for punching a police officer (who had provoked him). Danny is illiterate and not very bright. He is the only ‘straight’ member of a criminal family headed by Brittie (Rita Webb) and he has ignored her 11th commandment “Thou shalt never plead guilty”. In prison he is easily led and eventually finds himself involved in a scheme which requires him to cosh a prison officer. He hits the man too hard and discovers that killing a prison officer is one of six capital murder offences. Not surprisingly perhaps, the Lee family are portrayed as ‘cockney characters’ and the girlfriend Rosa is Irish. The Irish connection might come from O’Connor the writer. Rosa and Danny are both Roman Catholic. There is also a West Indian character in prison and others in the street scenes. There is a palpable sense of trying to ‘root’ the drama in a recognisable London, but aesthetically it isn’t quite there yet. The social commentary is certainly there with references to both racism and homophobia in the script. Overall the play now appears ‘rough and ready’ and seems best categorised as still ‘experimental’. The closing scenes in the condemned man’s cell are very moving and the social chatter of the hangman and his assistant is quite startling. Years before Pulp Fiction, their chatter about the techniques of the job (where to place a knot in the noose etc.) alongside sleeping arrangements and tales about the Nuremburg trials in 1945-6 are effective in making executions ‘real’. I’m not sure whether or not Loach would have seen Berlanga’s The Executioner which screened at Venice in 1963 but that film takes a similarly prosaic view of executions (as well as satirising the system). Loach would later be accused of being didactic but Three Clear Sundays works well because Danny is clearly ‘guilty’ but in no way ‘deserves to die’ –the story may well be ‘loaded’ in this sense but the presentation is ‘straight’. There is no evidence that the play greatly influenced audiences (public opinion in the UK seems to have been unchanged throughout the 1960s) but it must have had an impact. Unfortunately, none of Loach’s interviewers seemed to have asked him about this play (please comment if you know of any other interviews). Presumably Loach and the cast and crew had little time to make these plays. Loach directed six such plays of 75-80 mins each all of which appeared in 1965. Three Clear Sundays is the earliest example of Loach’s work available on the DVD boxset ‘Ken Loach at the BBC’.